Amy Opsal “Entered-For-A-Chance-To-Win”… and she won! A few weeks ago, the NVL released a sweepstakes on social media, offering a FREE ALL-INCLUSIVE STAY at Club Med Sandpiper Bay in Port St. Lucie, FL. during the NVL East Coast Championships. Dreams do come true. Amy and her sand partner will not only be coming to watch the pros battle for the title, but she will be participating in the NVL qualifier on Friday, May 20th. We sat down with Amy to talk beach! Stay tuned this weekend to watch Amy climb the qualifier. How do you feel about winning this sweepstakes? I am so excited to win this sweepstakes! I’ve always wanted to attend an NVL event but never had the opportunity until now! What opportunity has this sweepstakes given you? This has given me the opportunity to not only attend but participate in an NVL Qualifier! Do you follow our social media channels? What do you enjoy most about the NVL? I love that the NVL is a big backer to #GrowTheGame! Beach volleyball is becoming more and more popular and I would love to see it spread into the high school and college level in the Midwest. What do you enjoy most about the content that we put out? Whoever does the humor captions is spot on and the fitness and recovery training is really helpful. Tell us a bit about your volleyball career. I played in high school and then was recruited to play DIII at Augsburg College in Minneapolis, MN. I had the pleasure of playing against Molly Menard while she was a SR at Eau Claire! After that, I started playing a few open gyms and was asked to play in some grass tournaments and R4’s leagues. I just started playing doubles in 2014 and am loving it! My current partner, Kelsey Skoog, and I met during winter league play and decided that we really wanted to commit time to playing more doubles. We just clicked after that. She’s an amazing person, competitive but loves to have fun with it. 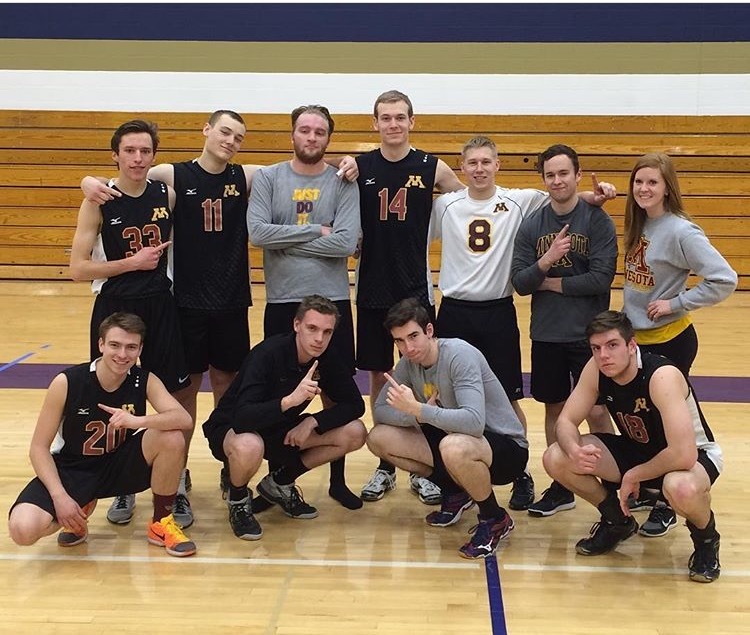 Additionally, I have coached (assistant) some very talented players at Lakeville South High School, Go Cougars, and coach the Men’s Club Team and the University of Minnesota, Go Gophers! Biggest challenges in your career? The biggest challenge in my career I have found is my height (5’5). I try not to use it as a crutch, but I am not going to pretend to be 5’10. There’s a lot of other things that I’ve tried to improve to make up for it – like my speed, my serve, and my shots. Hopes for the future of the sport? I would love to see the game grow in all areas! I would love to see boys and men’s volleyball spreading in the Midwest and to see a few more colleges pick up sand volleyball as an NCAA sport, now that the NCAA had a fairly successful first year of it! I believe volleyball is one of the most powerful and dynamic sports where athletes have to overcome multiple “un-controllables” from year-to-year rules changes to elements of nature. Volleyball is one of those sports that you need to have speed and power as well as precision and grace in your execution. It would be great to see more players specialize in more than one position.